I joined another quilt bee, but my month isn't until September. I've decided ahead of time that I'm going to ask for blocks like the Setsuko Inagawa quilt from this year's Tokyo Quilt Festival. Jan was a legend and took all sorts of wonderful photos and closeups of it. It's been the buzz of flickr since January. Edit: I actively searched for the original source of this block without much luck. Luckily the internet is full of helpful people. Thanks to Amy, I now know this block is attributed to Nancy Cabot, 1938 Source: Barbara Brackman's Encyclopedia of Pieced Quilt Patterns. 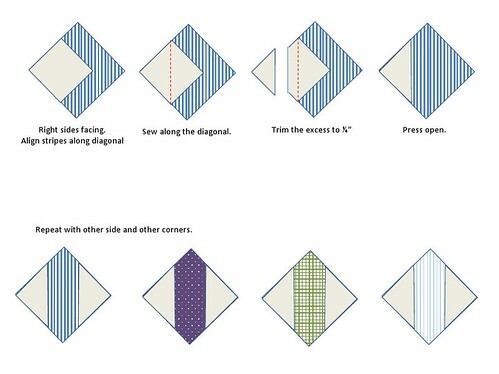 I couldn't find the pattern in any of our Japanese quilt books, so I decided to reverse engineer it. 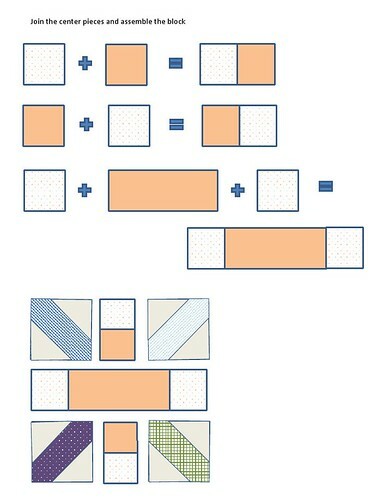 So I futzed in Word and posted some diagrams to flickr for my quilt bee girls. Shortly afterwards, I was inundated with requests for a full tutorial. I was also approached by several girls wanting a sewalong (details at the bottom of this point). 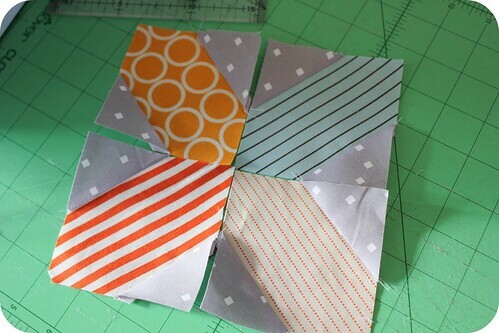 Though my quilt bee month isn't until September, I said I would do a blog post about how I made the blocks. Bear in mind, this is my method. This is not necessarily the one used to create the actual inspiration quilt above and my sizes might vary slightly from the actual quilt. It seems to work well for me. Also, my test blocks are a bit rough. Corners are missing, threads aren't trimmed. Fabric isn't pressed. For me this is a scrap eating project, not an heirloom. So if my points drift a little or I put a piece of fabric in backwards, I'm not going to beat myself up over it. I want this to be relaxed and fun. Each block is made up of 7 total fabrics. 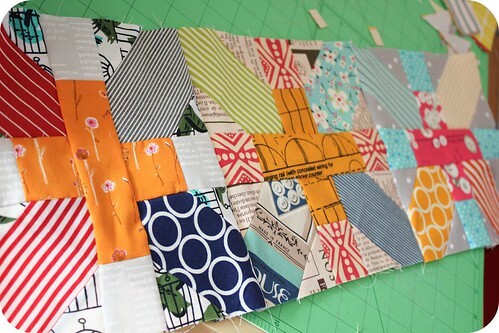 This quilt is very scrappy, so it does not matter if you choose lights or darks for each area. Just make sure you have 7 total fabrics in a block. 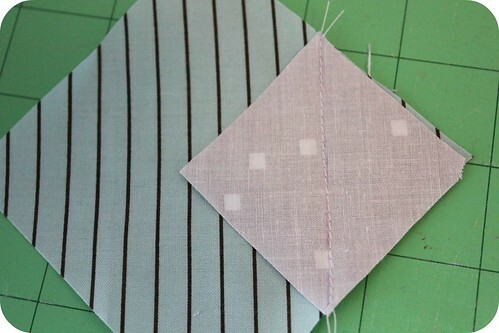 After testing several blocks, I believe at the four fabrics for the x look best when they are cut on point so the print runs along the length of the x. Visually this gives you the strongest impact, but it is more difficult to sew because the fabric can stretch since it's cut diagonal to the grain. 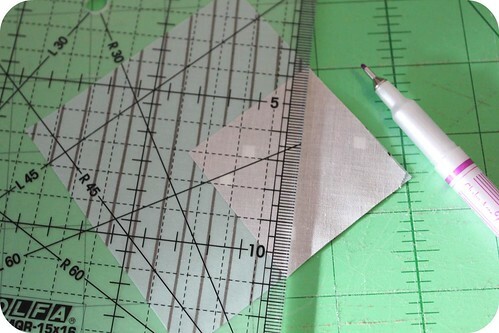 You can cut a 3.5" square on point out of a roughly 5" straight square. So if you are scrap gathering, looking for fabrics about this size. In my example, I choose quite a few stripes in case this wasn't clear. 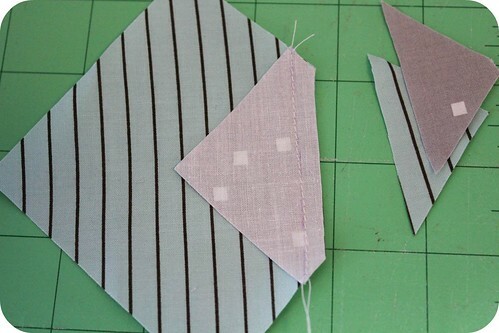 Feel free to fussy cut some fabrics so their design ends up centered on the block. If you look closely, you'll see that the original Japanese design is quite fussy cut. The dots usually align perfectly down the center. There are special pieces. Scrappy or fussy. It's up to you. 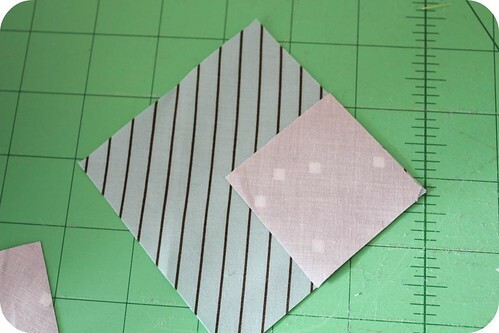 If you omitted the center cross and cross edges, you would be left with a traditional quilt block pattern called the Road to Tennessee or Indian Hatchet, depending which source you use. For each block, we create four x branches or corners. Begin by aligning one 2" background square onto of one 3.5" aligning the corners with right sides facing. Note: the stripes run vertically. 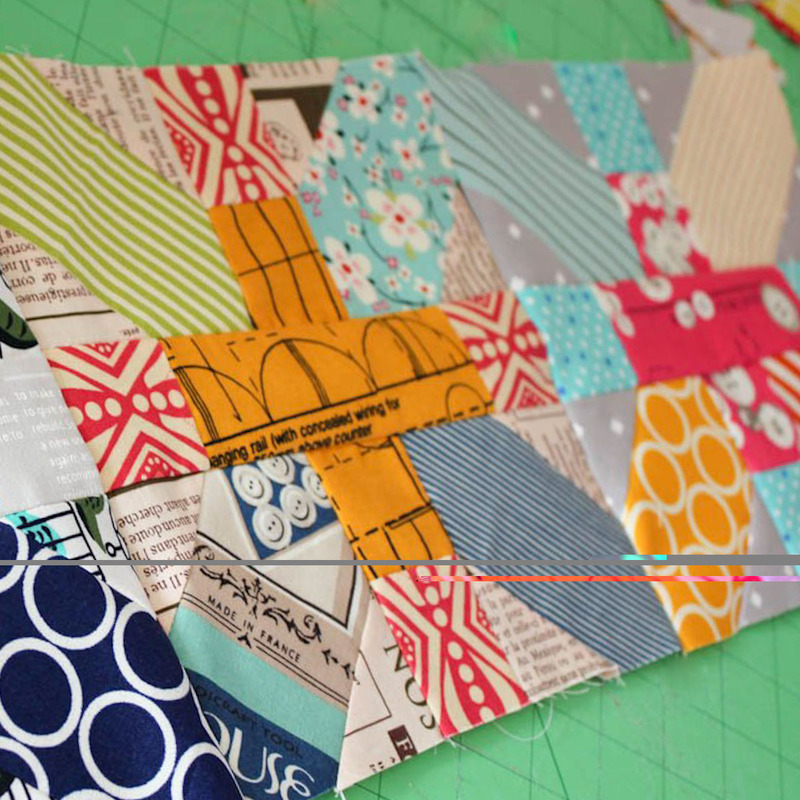 This will have the biggest impact visually for your quilt. In the original Japanese quilt, most stripes on the corners run vertically, but there are some exceptions. 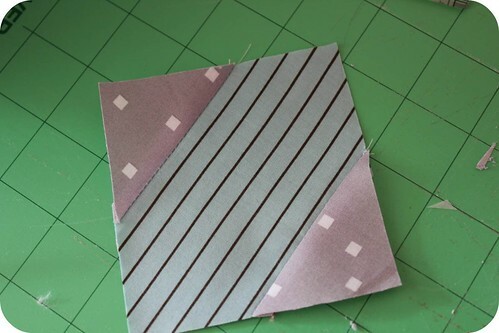 Using a fabric marking pen and straight edge, draw a straight line for corner to corner on your background fabric as shown. As you can see, even without the center cross, this quilt design has quite an impact. I believe these are called Indian Hatchet or Road to Tennessee blocks and they are traditionally made in the inverse with a common fabric on the X and scrappy fabric in the little triangles. Well-schooled quilters, please feel free to correct me. I'm always happy to learn. Tip: Making each corner one by one can tedious, so I like to do all of my marking in one step and then chain piece to make the process faster. I originally drew diagrams in word, but was asked to take pictures of the block making process, so feel free to print them out instead of the full blog post. Making the + in the center of the x is simply a matter of laying out your fabrics and sewing the pieces together with a 1/4" seam. That's it, your first block is done! I've been doing test blocks, but haven't put much together properly yet. I have until September before I get started in earnest. You can see how it's going to shape up though. I know my blocks look a bit rough. Remember, I'm making something fun for me and not an heirloom. Patchwork doesn't always have to be perfect, but it should always make you happy. 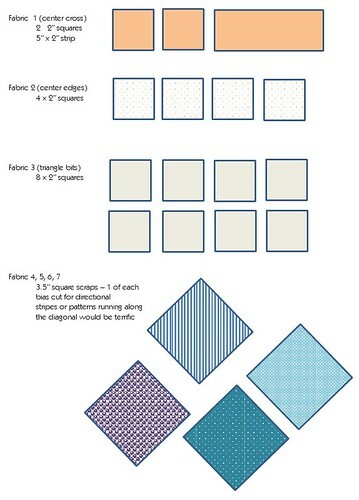 Once again, I think its important to mention that this tutorial is inspired by Setsuko Inawaga's submission to the Tokyo Quilt Festival. If you make one and are assigning credit, it really should go to her. In addition to these blocks, the original quilt has some stunning applique work, test and macarons. I encourage you to run with this idea and make it your own. Also, I am thankful to Jan (Be*Mused) for her love of Japanese fabric and quilting and for sharing years of photography from the Tokyo Quilt Festival. That's it! If it doesn't make sense or something is unclear, do ask. I'm sure others have the same question. I'll update the tutorial in that case. Or if you have any tips or suggestions, I'm sure the girls will love them. 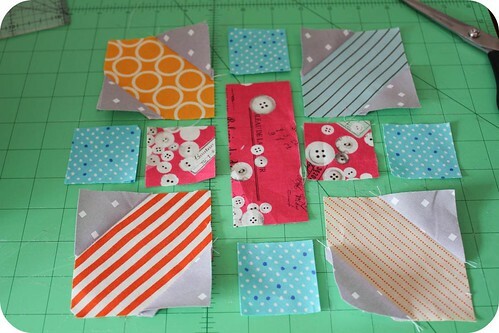 Laura has already started one of the japanese x and + quilt-along groups on Flickr. I believe they are officially kicking off in June. Feel free to join them and discuss colour ideas, share scraps from your bin and get ready! These are really awesome! thanks for putting this together. What's the final block size? 8"? Thanks again Amy! I'm going to try and make my blocks bigger, I'm a bit impatient like that! Great block! Thanks for the tutorial! I love this block! I'm going to add it to my To Do List. "Patchwork doesn't always have to be perfect, but it should always make you happy." - Best sentiment ever! Thanks for the tutorial, I love that quilt! I'm definitely going to give this a try. THANK YOU, AMY! When I saw the block I thought of having my virtual bee make some for me. Hope you don't mind if I swipe this idea and send them over for your fab tutorial. As kismet would have it, my bee month is May. Sweet! Amy!! Thank you SO much for figuring this out - I love this block. There are so many possibilities with it. I can't wait to see your finished product. I love the original quilt inspiration and thank you for the reverse engineering. I expect I will be making some of these soon! 'Thought you'd like a heads up, it looks like the 8th or 9th flickr image isn't working? flickr says it's unavailable? i love this amy, thanks for writing up the instructions. 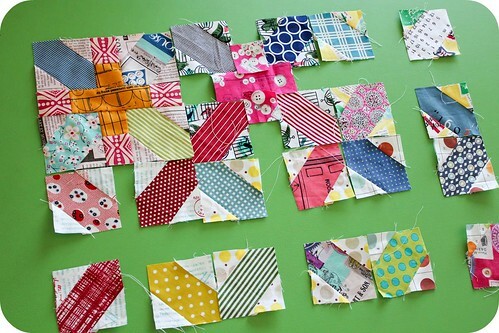 I really am inspired by the block, my scrap bins are overflowing! Love the block. Thanks for the tutorial. Hugs. Wow! !Fantastic post..Nice tutorial shred..I like your such block pattern..it looks awesome. Great block!! Thanks for sharing the pattern with us. How fun is this block?? Super great fun. Thank you for the tutorial. Thanks so much for this tutorial! I feel like I was meant to make this block because I have a 2" square die and a 3.5" square die for my Accuquilt die cutter. I'm super lazy when it comes to rotary cutting these days! That is such a pretty and eye catching block! Thanks so much for the how-to, I'll be spreading the word. Thank you! So much awesomeness! I have so many prints that would suit this block perfectly. BTW, found this via One Pretty Thing. Many many thanks for taking the time to write and share a tut for this fabulous block - I love its uniqueness and sense of scrappy fun in all different fabric ! Much appreciated. Really COOL! Thanks for the TUT!!! I want to try it 'cause it's too cute not to!!! Amy, do you happen to have the instructions in pdf format? Thank you for this fabulous tutorial! Very inspiring! 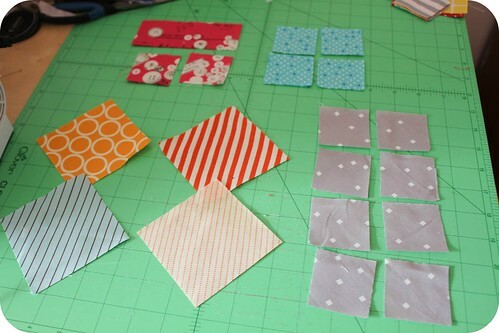 I just began a scrap quilt using outgrown baby clothes. You can see the beginnings of it here. love it. I'm looking forward to trying it out! thanks for the tutorial... making some of these tonight! I like this block. I'd like your opinion on measurements if I wanted to make a 12" block? You just made my day! 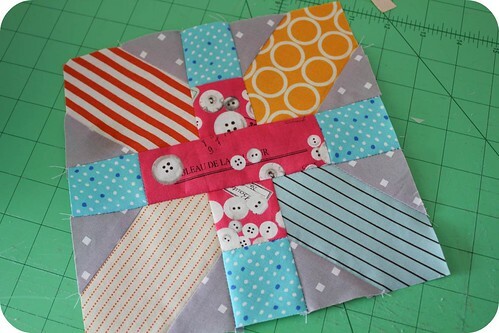 I am always trying to find ways to use my scraps and you just shared a wonderful way! I'll be making these this week. Thank you for your thoughtfulness of sharing with the rest of us quilters! It is very generous. We all *heart* you! Is there a good way to print this? I tried printing to a pdf, but I just get the first screen in triplicate. I was going to print not all of it, just the diagrammy bits - maybe I'll just pull them off of flickr, but if there's an easier pre-made way to print, please let me know. I am having the same difficulty with printing, but I am getting only the first screen. It would be great to have a PDF. I wouldn't care if you were to watermark the heck out of it. Hi, I love this block! 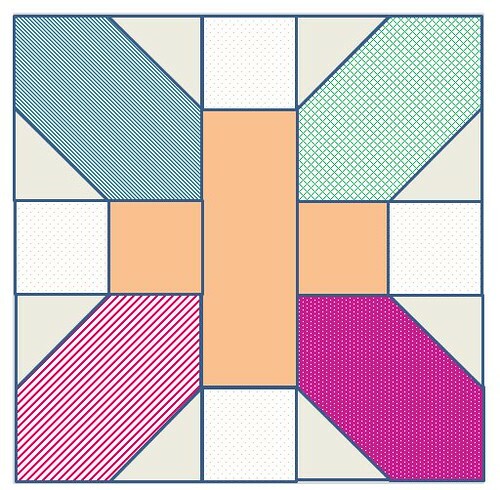 Do you have any suggestions for selecting fabrics for this block? I haven't been able to quilt in a couple of years and I'm feeling a bit stuck on fabric selection. Thanks! Making these in my quild - love,love,love.. thanks so much for sharing!! Thanks so much for the tutorial - I think I need to try this one. Sounds like your block exchange is going to be tons of fun - enjoy! This block looks like something I would enjoy making. thanks so much for sharing. Beautiful! Thank you so much for writing this up. I would love a 12 inch block draft. Pls send if you have one or bigger size. I'm making this quite right now - thanks for the inspiration! I finished it! Thank you so much for such a clear tutorial. I love it. Just wondering when cutting the 3.5 inch squares, if you don't have an obvious vertical design, do they need to be cut on point? Will it matter if some squares are cut on point and others are not? You are a rockstar! Thanks so much for your comments!